I saw my friend post about yummy tuna melts on Facebook this morning. Then it hit me how badly I NEEDED tuna melts. One problem though: no bread in the house. Which... kind of a big problem in terms of tuna melts. I popped out into the garden and found some zucchini that had been missed and were quickly growing and needed eating. AND SO MY NEW FAVORITE LUNCH WAS BORN. Audrey (age 3) was super pleased with the thought of eating 'zucchini boats' and gobbled hers up. Margaret (19 months) preferred hers with crackers, but whatevs. I'll forgive her because she's cute and she doesn't know what's good for her. Heat oven to 400F (200C). Slice zucchini in half and scoop out the seeds to make a 'boat'. Drizzle with olive oil and salt. Grill in hot oven for 15-20 minutes or until tender. While zucchini is in the oven, mix the tuna filling. To make the tuna filling mix together the tuna, mayo, garlic, mustard, crushed crackers, squeeze of lemon juice, dill, salt & pepper (to taste), and worcestershire sauce. Add extra mayo as needed. 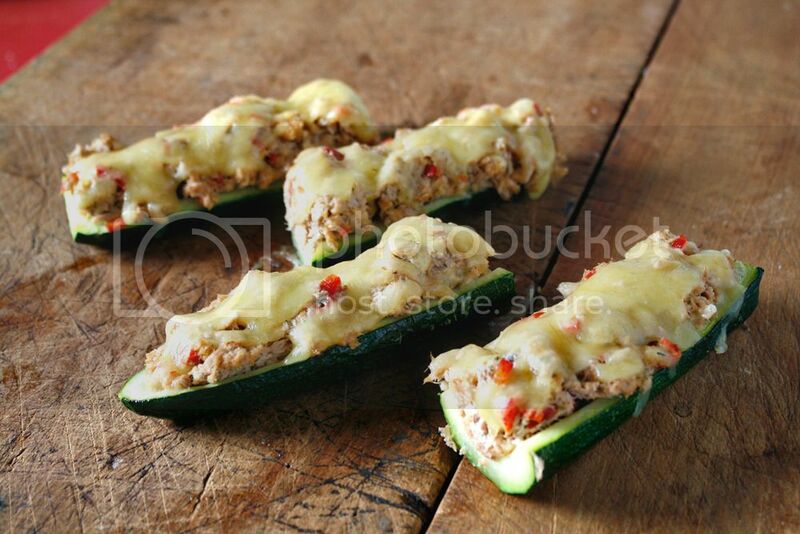 Fill the zucchini boats with the tuna mixture, top with cheese, and grill for 2-3 minutes. Okay, so this is a little late but it's too beautiful not to document. We've made it a tradition to go camping around Christmas and the New Year. It's a lovely time of year and we've got an absolutely gorgeous spot. There's a little cabin next to a creek and we're tucked in by rolling hills, trees, and the calls of native birds. It's perfect really. The first year we went I traipsed through the fields with Audrey gathering wildflowers and weeds to fashion into a flower crown for the girls. We took some photos and spun around enjoying our hard work and resolved to do it again next year. This year was no exception and we went camping in the same beautiful spot with family. As we were packing up we braided another flower crown to document our little holiday. Seeing these photos side by side fills me with pride at my beautiful girls and makes my heart ache a little at how fast they grow. So here's to family holidays, little traditions that make things special, and soaking your children up before they grow up. Because they grow up way too fast. Enter the Scout Tee by by Grainline Studios. This loose fitting tee fits the bill perfectly. It requires very little fabric (think stash busting!) and is very easy from start to finish. It's stylish in that it manages to look a bit fancy but is sooo so comfy. So much win! This pattern is actually designed for woven fabric and I have big plans to make some fancier blouses but it also makes a killer knit tee. This pattern is masterfully drafted and has very clear instructions that are easy to follow. PLUS, it's very easy to modify! I lengthened the Scout Tee to a more flattering length for me and made the neckline binding thinner to give it a more polished look. I have plans to try and alter the pattern into a sheer peplum and a longer baby-doll tee dress. How to accept a compliment with class - An important lesson for everyone! Have you been guilty of discounting or brushing away compliments? Self Lymph Drainage Massage - This was INVALUABLE to me this winter. I know we're heading out of colder weather now but it doesn't mean you can't get a bad head cold. I was dizzy for days because of all the sinus pressure, but after I did this massage my ears popped and I wasn't dizzy anymore. Many amaze. A smart fight for awareness against food waste - I saw this campaign and thought that it was brilliant. It's a good reminder that just because food isn't picture perfect doesn't mean it's only good for tossing out. Fight food waste. Perfecting serger tension - This. Because overlockers don't need to be a terrifying mystery. The Myth of the Perfect Job - I found this series really really interesting. It's made me rethink a lot about careers and happiness. It's a multi-part series and I highly recommend it. It's quite good reading. High-tech Silverware that assists those with hand tremors - I think this will mean a lot to those with tremors! This is a brilliant invention, in my opinion. I made this skirt ages ago (more on that later). It just never really clicked with me. I mean, it was always just OKAY in my mind. A good staple, but a bit boring. Do you what I mean? I'd been playing around with the idea of hand printing fabrics for ages but I didn't have a specific project in mind. Then it hit me. What my skirt needed was some personality. It needed some zing. What it NEEDED was some hand printing. I played around with the idea of handprinted triangles or parallelograms, but after a failed experiment I decided to go with imperfect swipes with a paintbrush. Zing badabing. It was just what this skirt needed. I used a bronze textile paint and an acrylic paintbrush, laid the skirt out (with newspaper inside the skirt so that the paint didn't bleed through), and had it! It was a simple project that I knocked out in an afternoon. After the paint dried I set it with a hot iron so that the paint wouldn't wash out. Now I have a skirt that I finally love.